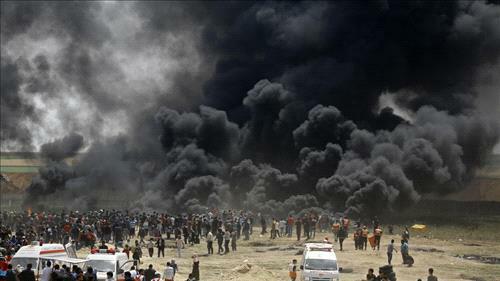 AMMONNEWS - Gaza's Health Ministry says 112 Palestinians have been wounded by Israeli army fire or treated for tear gas inhalation, but did not provide a breakdown. The injuries were sustained during a mass protest Friday on Gaza’s sealed border with Israel, the third in as many consecutive Fridays. Thousands of Palestinians gathered at five tent camps, several hundred meters (yards) from the border fence. Smaller groups moved closer to the fence, burning Israeli flags, throwing stones and torching tires. In all, 27 protesters were killed and hundreds wounded by army fire since late March.